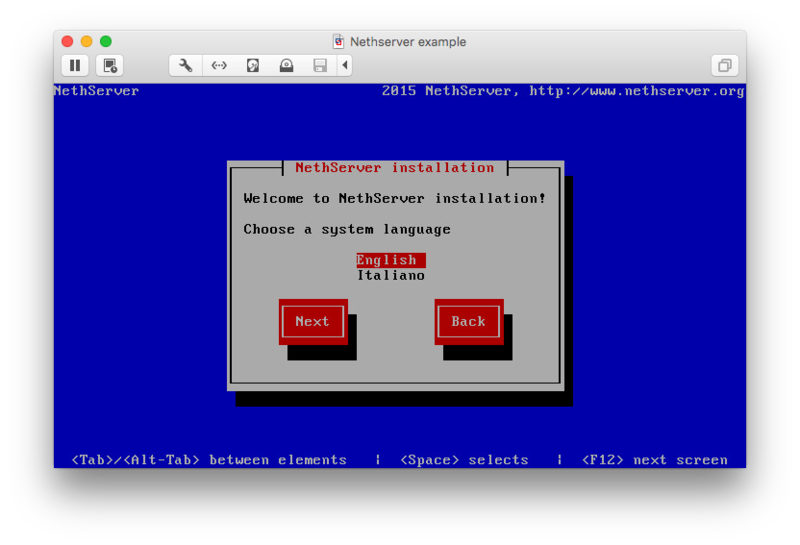 Screenshots of the steps to install Nethserver 6.7 using ESXi (using vSphere Client on OS X 10.11 - with the assistance of CodeWeavers CrossOver/Wine since the vSphere Client is only available for Windows). Those running a Windows system can disregard the OS X window frames, it's the content of the windows that matter! 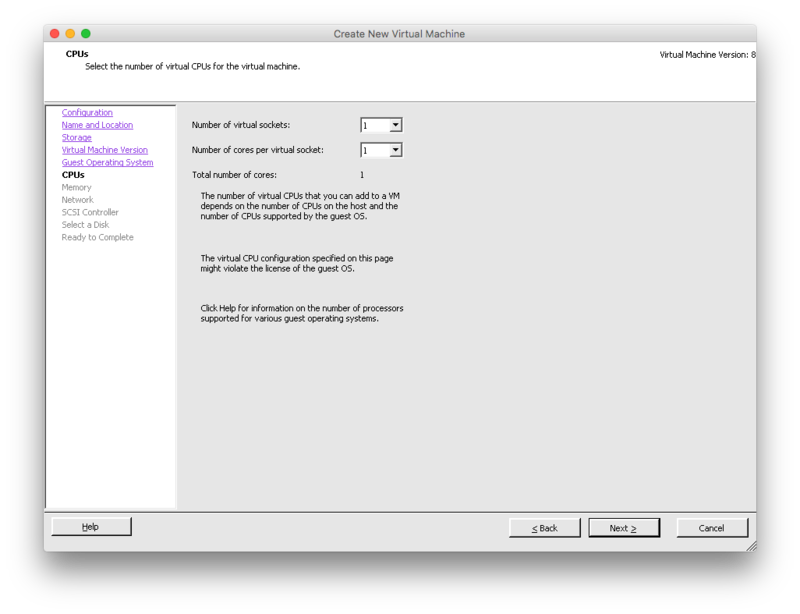 2) Enter the the name for your Virtual Machine and click Next. 3) Select the datastore you want to use to store the VM's files and click Next. 4) Select the most recent virtual Machine Version (in my case 8) supported by your ESXi host and click Next. 5) Select Linux and version CentOS 4/5/6/7 (64-bit) and click Next. 6) No changes needed, click Next. 7) Set amount of memory (my production server has 5GB allocated) and click Next. 8) Accept the default settings, click Next. 9) Accept the default setting, click Next. 10) Select create new virtual disk and click Next. 11) Adjust the disk size to your liking and click Next. 12) Accept the default settings, click Next. 13) Almost finished but, click Edit the virtual machine before completion and click Continue. 14) Select New CD/DVD, select the location of the downloaded Nethserver ISO file. 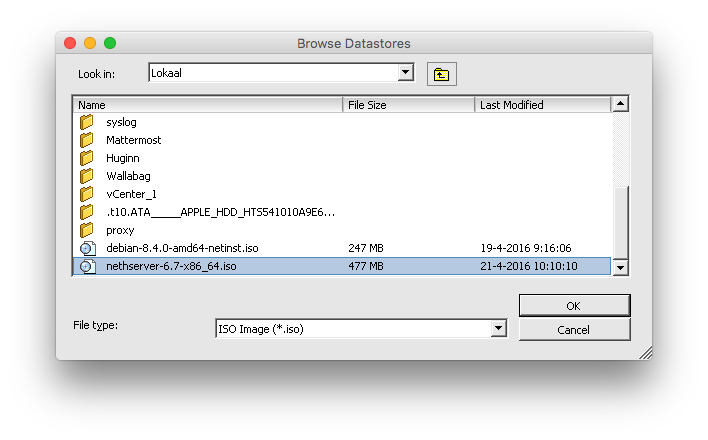 In my case it is in a Datastore on the host, so I select Datastore ISO File and click Browse. 15) Select the previously downloaded Nethserver ISO file, make sure connect at power on is selected and click OK. Your VM is now ready to be booted for installation. 17) Start the VM (in my case using VMWare Fusion for Mac) and open the console. 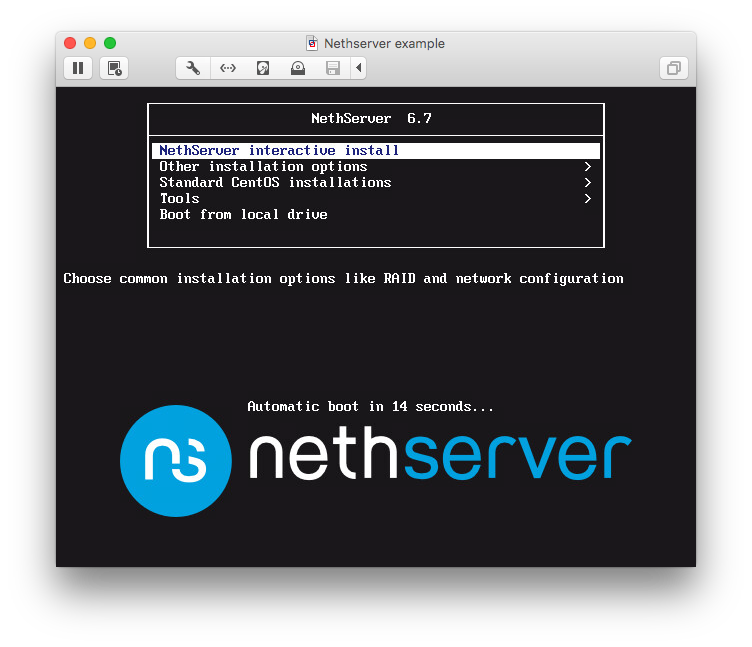 No actions needed Nethserver automatically boots into the interactive install. 18) Using the console you can now follow the regular installation instructions. 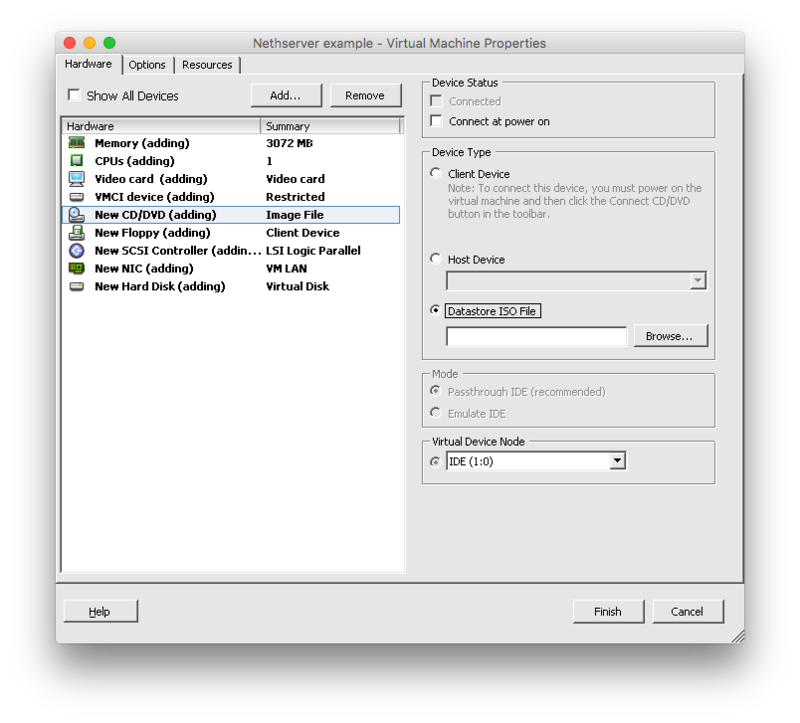 After finishing the installation and initial configuration of your Nethserver virtual machine it is always a good idea to install VMWare Tools in your VM. VMWare Tools?? VMWare Tools is a suite of virtualization utilities that improves the functionality, administration, and management of virtual machines on VMware hypervisors. Open VM Tools is the open source implementation of VMware Tools. 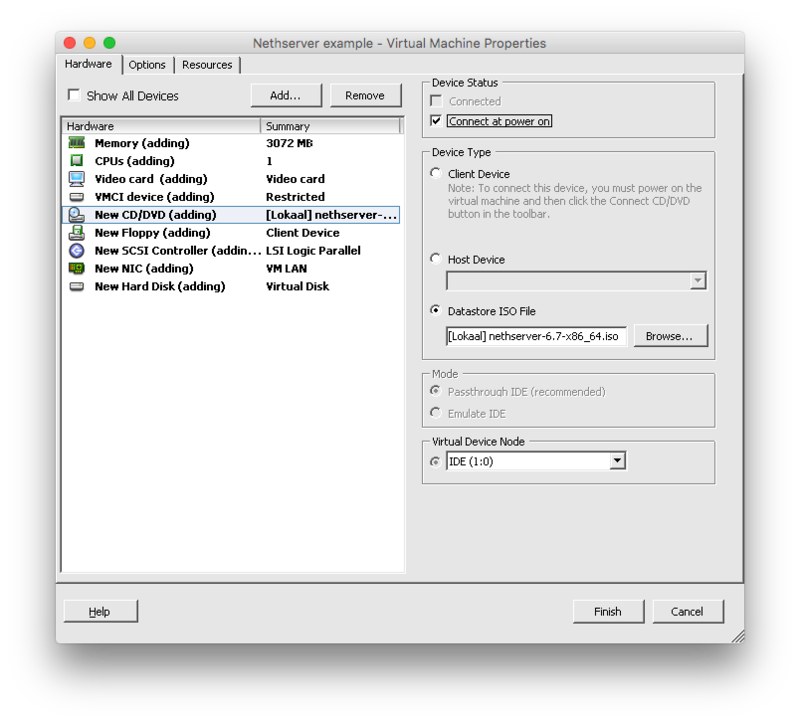 VMware recommends using the Open VM Tools redistributed by the operating system vendors. That is it, Open VM Tools installed!